A plot to kill the president, links to foreign intelligence, a rogue police officer and a missing sniper: the snippets of news emerging from Sri Lanka in recent weeks seem plucked from the pages of paperback fiction. The plaque which acknowledged the contribution of late Prime Minister, D.S. 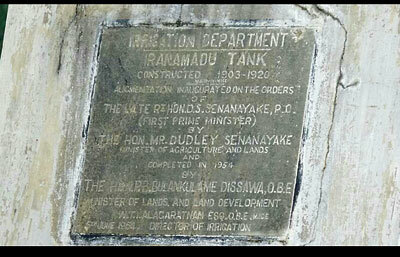 Senanayake, and the opening of the renovated Iranamadu Tank in 1954 by then Agriculture Minister Dudley Senanayake has been completely destroyed and replaced with a plaque bearing the name of President Maithripala Sirisena. The construction of the Iranamadu tank which is regarded as the ‘Gem of Kilinochchi’, began in 1906 and was first used for irrigating fields in 1922. 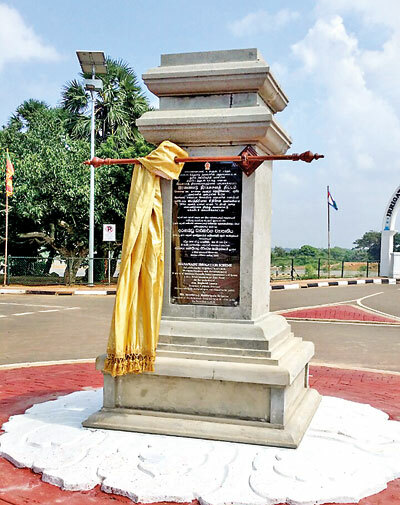 The plaque bearing the name of the first Sri Lankan Prime Minister was preserved and respected even by the LTTE during the height of the war. Reconstruction work which began in 2016, concluded in August 2018, costing Rs 2,130 million. The tank was recently reconstructed under a project launched by the National Water Supply and Drainage Board along with the Asian Development Bank and was re-opened by President Maithripala Sirisena on Friday During reconstruction, the old plaque was completely destroyed and taken away to make room for a new plaque indicating President Maithripala’s Sirisena’s presence at the event on Friday. 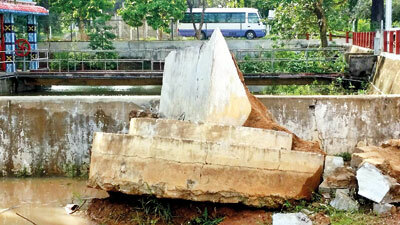 V. Premakumar, Provincial Director (North) for the Irrigation Department, yesterday claimed that the department was planning to instal the old memorial stone at a different location, but journalists who visited the area noticed the foundation stone had been destroyed. Where people must fight in and out of their season. Now whom can you turn to and call your own brother? What deeds will come under the sorcerer’s spell. And Friday once more brings in some new trash. Wielding pen and paper, robed in his nightgown. “Are the people still awake? It’s now ten o’clock. And only just a very few were ready for the show. Appointments and removals came as quick as quick could be. While entrants through the back door, clapped their hands in glee. The Parliament has been dissolved, what next would now betide? That now the rules found in the book would he for certain flout. A third and famous Friday came, one which we can’t forget. A day like that is still not found and in our history set. Alas! He went through all of that – but it was cancelled by a note. So it’s Friday Night ‘Specials’ that we do all expect. It’s become like a habit – one that cannot be checked. We can’t take the usual, for it’s no longer there. Like everything else it just wafts on thin air. What this Friday has brought to us all far and near. While conjurors will twist things this way and that. Dialog Axiata PLC and Ericsson, two of the leading communication service providers, and the Ministry of Telecommunication, Digital Infrastructure and Foreign Employment, signed a Memorandum of Understanding to set up Sri Lanka’s first 5G Innovation Center. Enhanced fines and penalties, including an increase in jail terms, and new areas of taxation, are among the highlights of the new Inland Revenue Act to be implemented from April 1, a senior official said. The Inland Revenue Department’s Deputy Commissioner General, Nadun Guruge, told the Sunday Times there would be key changes relating to income tax to achieve the Government’s target of Rs. 800 billion a year. A convict in the assassination of former Indian Prime Minister Rajiv Gandhi has claimed that the man who made the bomb to kill the Indian politician is in Sri Lanka. Sri Lanka is adopting an advanced software used by football club Barcelona to manage its injury-prone cricketers as the national team trains for the World Cup next year, officials said today. The UN's political chief on Sunday condemned anti-Muslim violence that has targeted mosques and businesses in Sri Lanka as he wrapped up a three-day visit to the Indian Ocean island-nation. By Andrea Sachs -- A recent conflict in Sri Lanka has interrupted travelers’ reveries of sacred Buddhist sites, languorous beaches and Ceylon tea moments. But careful planning — and heightened awareness — are helping keep dream trips to the Southeast Asian island alive.